Triple Slide Mobile Suites Fifth Wheel by DoubleTree RV w/Rear Living Area Including Sofa w/End Tables & Overhead Cabinets, 2 Recliners & Table & Chairs Slide, TV Overhead w/Fireplace Opt. Below/Storage Cabinet/3 Burner Range w/Conv. Oven & Refrig. Slide, Pantry, Kitchen Island w/Double Kitchen Sink, Closet, Corner Tub or Shower, Private Toilet Area, Ward./Wash/Dryer, Sink w/Med. Cabinet, King Bed Slide, Wardrobe, Vanity w/Drawers & Overhead Cabinet & TV & Much More. If you're considering a recreational vehicle lifestyle, chances are you share our Love for the open road. For us, that love goes back 45 years when we sold our very first trailer in Mesa Arizona. Yes we're proud of our history and we're not looking back. In these pages you'll discover what makes us a premier RV dealer, from our continued dedication to customer service and our exclusivity to top of the line luxury coaches such as Monaco's Holiday Rambler. 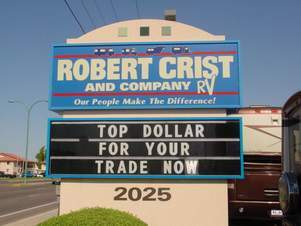 Whether you're looking for the value of a towable, the excitement of a toy-hauler, the convenience and economy of a gas motorhome or the top of the line luxury diesel coach Robert Crist and Company RV has an unbeatable model to fit your budget. It's our stated policy to treat every visitor to our dealership as an honored guest in our home every day, every time, without fail no exceptions, so please visit us very soon to see first hand why our people make the difference. After 45 years in the RV industry, we have maintained the highest standards to earn the trust of our over 50,000 RV buyers here in Mesa, Arizona and throughout the nation. With our venture into On-line selling over nine years ago we have built the most successful Internet Sales department in the nation. And when you buy your RV from us, you will receive our Priority RV Road Care Program. And Western Horizon Resorts Getaway Vacation! Robert Crist and Company RV is a founding member of REDEX. The REDEX Buying Group is comprised of 84 dealers across the country to serve you and your RV needs.